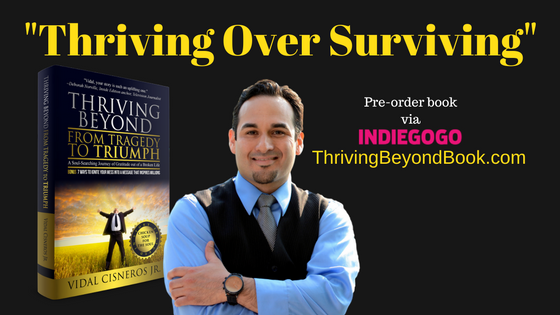 Thriving Over Surviving - Vidal Cisneros Jr.
As of late “thrive” has been a buzzword of choice, but what does “thriving” even mean? This is what dictionary.com came back with. Which leads to — Why should a thriving life, be important? In this era of digital platforms, attention has become the social currency of choice. Thriving is far from achievable sitting idle with excessive screen time, on our favorite social channel vying for clout? Entertainment? Or instant gratifying benefits? Thriving exists when we have the intent to grow regardless of comfort level, which cracks open a higher level of arousal and engagement. Then there is the next level of thriving, first-hand knowledge as lasting intrinsic benefits occur through uncovering our God -given purpose driven abilities, insights, and experiences. This quote by David Orr, from his 1992 book Ecological Literacy: Education and the Transition to a Postmodern World is missing an important piece. The “thriver’s,” and their stories of impossible situations which shift belief into what’s truly possible. Having interviewed TEDx speakers, best-selling authors, and social entrepreneurs, they’ve confirmed that one monumental shift moves perception from idleness into purpose-driven intention. 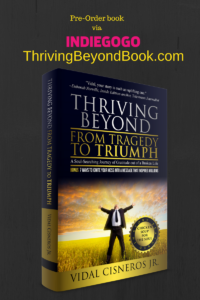 How Can We Thrive Today? First, we can start where we are in our communities by making a choice to fill a need. Volunteering our time, money, and or material possessions for charity and stepping into servitude keeps a community thriving when we help the disenfranchised and become part of the solution within our society. Next, making a choice of being in a state of gratitude is important to a thriver. Being grateful within our thoughts, words, and actions — brings enlightenment. Finally, ramp up intrinsic momentum by strategically journaling to ignite a state of gratitude. What the world needs are the peacemakers, healers, restorers, and thriver’s to leave their imprint on the world. This might me be too soft for the hard-nosed, but rest assured one-day life’s obstacles will have us considering otherwise, perhaps? Which leads back to the first question, is thriving better than surviving? And does surviving stretch us to the brink of our limits, towards breakthroughs that follow our”rock bottom” crashes? When we’ve experienced “the worst,” we’re easily open to “the best” opportunity as the only way, if we’re willing to accept. With the ability of free choice, we can elevate our world away from hate and despondency, to making the world habitable and humane. This responsibility shouldn’t rest on our political leaders or government to fill the void. As we’ve seen they’ll fail us — truth is it rests on us all. As forty years of existing enters for me, counting the years of thriving beyond limiting beliefs are the years that matter the most.